It’s been said that the first half of the twentieth century would belong to Picasso and the second to Duchamp. This refers to Picasso’s influence being that of formalist mark making and Duchamp’s being that of iconoclastic acts and gestures. By the nineteen-seventies painting had been declared “dead” (yet again) and artists were increasingly abandoning their studios for the life/art blur of happenings and performance. One summary gist of the difference was to define between icon (a represtantative stand-in for the real) and index (the evidence of an act, like a footprint). The Picasso/Duchamp metaphorical hand-off did not mention what this century would bring. 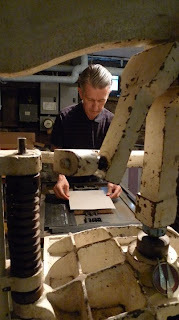 Nor did general summations address that photography and much of printmaking is both icon and index. So at the dawn of a new hundred years pluralism and hybrid practices are in abundance. Many artists are unabashed image-makers, the hand is evident again, and the modernist divide between art craft is fading into dated obscurity. It could be that the influence of the two twentieth century art legends now allows for an openness to what was thought of as opposing ideas. 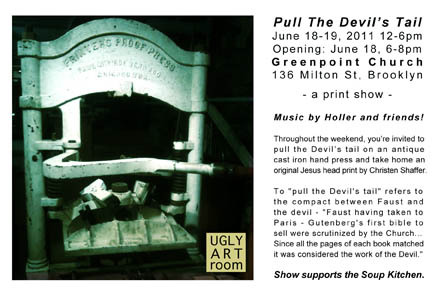 In the spirit of communal creativity, Ugly Art Room invites on comers to “Pull the Devil’s Tail”, a traditional term for the lever action, in this case a nineteenth century iron-cast hand press in the basement of the Greenpoint Reform Church. 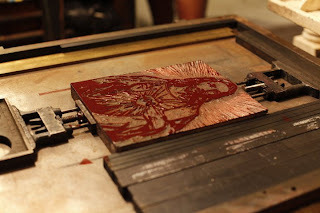 The repeatedly pressed image will be that of tattoo Jesus, the kind that sailors took directly off the wall of the ink parlor. Visitors will participate in an action (or index) that results in an icon. The event is rich with duality and suggestion. There is a history of print as the devil’s tool and here his “Hellbox” will be forced to repeat the image of his vanquisher’s son. The image being taken from a standard go-to tattoo will be “re-iconed” from religious image to body art standard to DIY community takeaway. The Gutenberg press has been credited with inventing the generation gap, creating the first times where an education would separate children from adult. Maybe this was considered the devil’s work. Here the machine of darkness will be working with the icon’s icon and everyone gets a chance to be an artist. 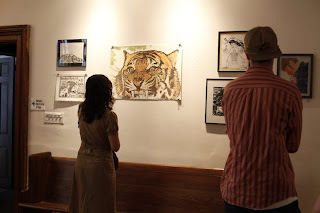 Ugly Art Room is asking for submissions of printed work in conjunction with the theme of iconography to be shown in the adjoining space to the printing press. As the Devil’s tail is pulled in one room, differing examples and takes on the repeated effigy will show the range of this practice in the next.